There’s a moment in The Fantasticks where Henry, an old Shakespearean actor, puts on his doublet to recite. “It’s torn, I know – forget it,” he says, asking El Gallo (and the audience) to remove, in their imagination, “10 pounds of road dust from these aged wrinkled cheeks.” In the Contemporary Theater Company’s current production, Henry (Terry Simpson) and the doublet are neat and clean, with nary a patch on them. It’s a small moment, probably unimportant in the larger scheme of the show, but in a way, it reflects the production as a whole: very polished and very safe, in a way that demonstrates the great talents of CTC’s company, but that doesn’t always serve the show as well as it could. 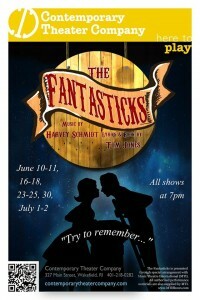 The thing is, Fantasticks is a great choice of show for CTC. Like last fall’s Sweeney Todd, the musical is well-served by the theater’s small space and intimate atmosphere. But this production, from the same directing team of Chris Simpson and Jean Maxon-Carpenter, is less scrappy and more sedate. 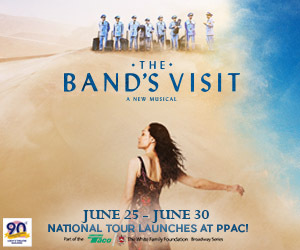 The play (with music by Harvey Schmidt and a book and lyrics by Tom Jones) contains admittedly dated language and stereotypes, which CTC has seamlessly and successfully modernized. However, treating the plot itself, a subversion of Romeo-and-Juliet-esque stories of love between children of feuding families, like it’s just as conventional as the targets of its satire dulls its point: that relationships are messy and that a love story doesn’t end at the altar. The production could skimp less on the young lovers’ passionate stupidity in the first act, or on the frightening elements of their separate journeys of self-discovery in the second. Slow staging of physical sections and a curious reluctance to follow through on some of the images the lines call for (striking in a show that’s intentionally visually spare) also contribute to the impression of sedateness. Amelia Giles is El Gallo, the bandit who plays a key role in securing the marriage between the boy and the girl. There’s no way Giles can pass for 40, as the character is described in the lines – the joke when the teenage Luisa (Isobel McCullough) calls her “very old, I’d say nearly 40” isn’t that she’s younger – but it doesn’t matter because she owns the stage as she swishes about in a long black coat. Since Giles’ role as someone who is outside the reality of the story’s little world as well as part of it is played up – El Gallo is always the show’s narrator, but in CTC’s production, she also serves some of the functions of the Mute, balancing a long pole on her hat to serve as the wall between the two houses or being on the receiving end of monologue – her age is a lot less incongruous than it sounds. And she’s got a wonderful voice, especially in the famous “Try to Remember.” Another cross-cast role is Bellomy (Ashley Moore), who in this production is Luisa’s mother; this distinguishes her a little more from Hucklebee (Tim Mahoney) than productions sometimes manage, and lets Luisa put a really interesting spin on her lines about “want[ing] much more than keeping house,” for instance. CTC has done a lot of daring work, and The Fantasticks is a great show for them as a company and as a space. Their cast and production team (a mix of complete newcomers and longstanding veterans) definitely have the chops to put the edge back on this play. The production also features Neil Motta as Matt and Kyle Couture as Mortimer. It runs through July 2 at the Contemporary Theater Company.